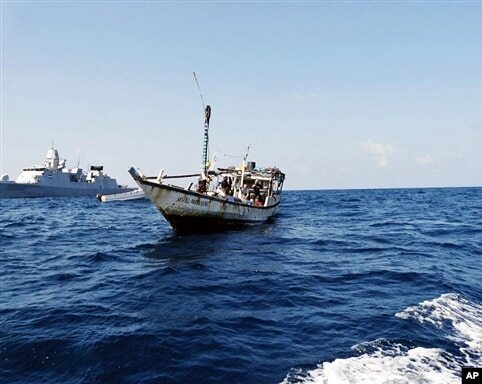 FILE - A handout picture received from The Netherlands Ministry of Defence shows a boat containing alleged Somali pirates being apprehended by Netherlands warship Evertsen. The World Bank says the only way to end piracy off Somalia's coast is to create a viable Somali state. In a report Thursday, the World Bank says delivering essential services to the entire country, reducing poverty, and creating opportunity are keys to ending the problem. The report notes Somali pirates have pulled in an average of more than $50 million per year in ransom payments since 2005. Pirate activity has dropped sharply over the past two years but the report says it continues to affect the economies of neighboring countries - particularly in the areas of tourism and fishing exports. The report says current anti-piracy measures such as international naval patrols and armed guards on ship are costly and may not be sustainable. 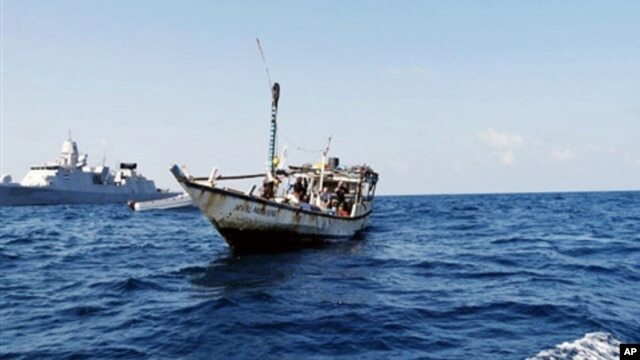 The report notes that Somali pirates rely heavily on onshore support from government officials, business people, clan elders, militias and local communities in order to secure regular access to the coast where they keep their hijacked ships. Senior World Bank economist Quy Toan-Doy says that any long term solutions will involve forging a political contract with local power holders.